Here you will get list of 6 best java books for beginners. Java is a programming language which includes much more concepts compared to C, C++, etc. Java is an almost pure Object Oriented Programming Language. To master Java it requires guidance of good books and tutorials. For this purpose here are some books which are recommended by many java developers and instructors throughout the world. These java programming books will help you grasp the Java language concepts from Basic to Advanced Level without going into Complex details. These books are great for beginners as well as Java developers who are professional or have some Java programming experience. All these listed books focuses on explaining java concepts by keeping the concepts related to Object Oriented paradigm. Here is the list of some great Java programming books. This book is said to be the Bible for Java programmers. This book covers all the Java topics from Beginner level to Advanced level as well as Core and Advanced Java concepts with easy to understand examples given in the book. Herbert Schildt, author of the book is a world renowned author and a very well known authority in Java, C++ and C#. 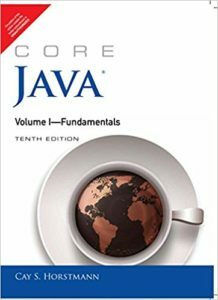 This book surely helps a beginner to get started with java and with a little enthusiasm, the advanced concepts can also be easily mastered with the help of this book. THIS IS A MUST READ BOOK FOR JAVA PROGRAMMERS AND DEVELOPERS. This book is one of the masterpieces of Herbert Schildt. This book explores all the concepts required by a programmer to get started with Java Programming. This book focuses on explaining java concepts in such a way that even an absolute beginner who has no prior knowledge of programming can also kickstart Java programming without facing any difficulties. For understanding the fundamentals of Java languages this book is a sure shot. Another best java book which covers all the Core java concepts in a methodical way. 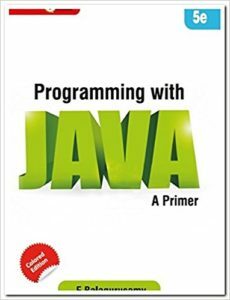 It is written by an Indian Author R. Nageswara Rao who has been teaching java since 2000. It helps the very beginner to learn the Java OOP concepts along with the important java concepts like Interface, Exception Handling, GUI application, Integration of Databases in Java, etc. It also covers interview questions which are Java Oriented and are beneficial for cracking Java interviews. This book by E. Balaguruswamy is a must read for absolute beginners as this book explores each and every concept in such a way that it brings conceptual clarity and proper understanding of the Java topics. All the chapters are weaved with simple language and the concepts are supported firmly by good and easy to understand examples. Those programmers who want to get certified by Oracle can also find sample questions before the appendix section. This is one of the books that is fun to read as it is more visual than theory reading which makes it interactive and interesting. Head First series is known to introduce learning through visual aids as they believe that reading 1000’s of pages is cumbersome and boring and human brain is more responsive to unusual situations, images or incidents. Although the concepts are explained in a beginner friendly manner but it also introduces some serious programming questions to get you started thinking like java programmers. 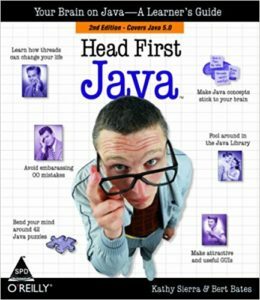 Kathy Sierra, Author of this book is a master java trainer and has been teaching at Sun microsystems. This is a must read for those who find reading lots of pages difficult and want to learn in a different way. This book focuses on clutter free learning which means it only focuses on explaining the java concepts to programmers nothing other than that. 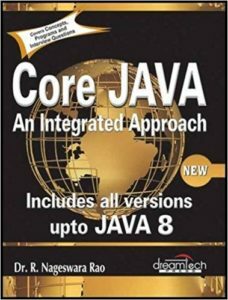 This book explains core java, library features and covers how to develop real world applications through java. 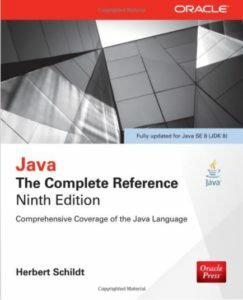 Although the book explains concepts in simple language but it may not be best suitable for an absolute beginner as it is focuses on explaining intermediate and advanced concepts of Java language. This is a must read book for those who knows fundamental concepts of Java and want to master those concepts through thorough understanding as it takes a deep dive into some serious programming concepts. Comment below what is your favorite and best java programming books.